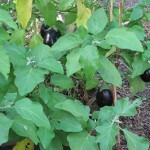 Eggplant Thriving Now, Saved from The Freeze in January. The fall of 2009 was very hot and humid. We didn’t have night time temperatures below 70 degrees f. until it was officially winter time. By the time New Years Eve rolled around we had begun to have extremely cold weather and it continued well into February giving us very few warm days in between cold fronts. We became exhausted experts at covering our cold tender crops. Everywhere you went you saw the towering yard ghosts common on South Florida yards when the temperatures dip into the 30’s. 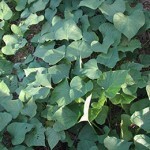 Those of us vegetable growers who had planted a combination of cold and warm weather plants came out the best. It was a great winter for carrots, radishes, beets, broccoli, cauliflower, onions, collards, lettuce, chard and kale. 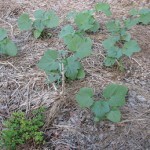 It was a terrible winter for peppers, eggplant, tomatoes, bananas, pigeon peas, beans, and squash, and in our unusually warm fall weather those warm weather plants had been vigorously growing. I stacked straw up around eggplants to save them, and they spent many days in a row covered in that way before it got warm enough to uncover them. 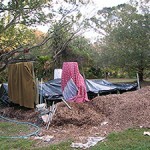 Tomatoes were covered in sheets to the ground, clipped to support frames. Most of mine died even though they were covered. In years past I had hung a drop light into the tent of tomatoes to help warm the air. I didn’t use the drop light trick this year because I had tomatoes growing in three different areas of my yard. 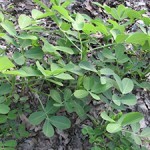 The plants on the lowest bit of land under high shade survived the cold. In my newest growing area the tomato plants, and eggplant, although covered to the ground did not survive the freezing temperatures. 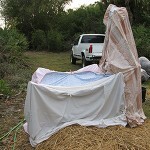 A tomato plant so small it hadn’t grown through its cage was easily covered with a heavy canvas sack, and I piled straw up around the base of that ghost. That plant survived to become a fruiting giant covering my counter tops with large yellow tomatoes for months. Conversely, I didn’t have to cover onions, radishes, beets, chard, broccoli, or carrots, and more than one morning I found ice on the broccoli leaves, and those plants easily survived to make loads of broccoli. The carrots I grew in that cold were absolutely the sweetest ever. Their snap was perfect, and their colors were bright and nearly translucent. In the spring I had three excellent tomato plants that made it through the freeze, and a few more that came up afterward. Several of the eggplants that I covered up in straw made it through and one is a tremendous plant from which I am getting five to six mature fruits a week now. The straw that covered my plants against those winter days is now mulch at the base of the same plants it sheltered. Covering and uncovering our gardens was tough. Some days we uncovered our plants just for the daylight, and recovered them before night fall. It was often dusk as I covered my last garden, and I remember having very cold fingers and a very cold nose long before I could go inside and warm up. 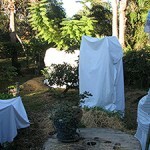 Most of us S. Florida gardeners are accustomed to having one to three nights during January and February when we might have to cover our plants. There were more than two dozen nights when the temperatures were way too low to hope we could get away without covering. We had 13 nights in a row below 40. This went on for so long that our plants really had a stressful time. Some growers just gave up, and began again in March. Gibbons Organic Farm, a greenhouse grower was forced to irrigate throughout the cold nights to keep the greenhouses above 40 degrees (f), and the flush of nitrogen and new growth in the warmed greenhouses drew aphids like crazy. Ultimately the plants were saved, and Gibbons Farm never came to the market empty handed, but not without some serious setbacks from the aphids. Even their cold weather plants were stressed and aphid stricken from the unusually long succession of cold days and the excess watering. The conventional farmer at our market lost all of his warm weather crops. He grows under the sky (no green houses) and had far too much in the ground to save, but he was able to stay in the game with his cold weather vegetables, showing up at his booth with broccoli, cauliflower, onions, carrots, radishes, beets, chard, and lettuce. I remember being really cold and tired from the constant covering and uncovering in really low temperatures, but I also remember when hearing people wishing for the summer to come, being glad for the cold and the gorgeous winter vegetables we were able to grow here effortlessly. 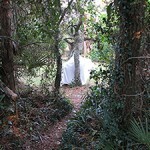 It is summer time, July in South Florida, and the yard ghosts are just a memory. The Passion Fruit has been falling for months, and is about to flower again. We are bringing in the first mangos and pineapples. 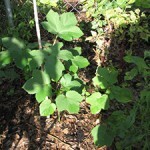 We are harvesting long beans, eggplant, red amaranth, malabar spinach, and black eye peas, I am watching okra grow up, and the bitter melon is flowering. I am piling up organic wastes for new beds, and throwing carbon wastes to the compost piles which shrink down as fast as I can build them up. Every day in the garden is a hot one, rain is always welcome, and when the wind comes west across the land from the ocean I hold my arms out and try to recall that long ago winter chill as the breeze catches my sleeves. Incredible photos–love those ghosts (they don’t scare me)! 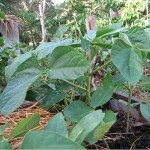 Thanks for the look into S Florida gardening and your experiences. The food is starting to grow in front of my eyes as I water every day. My little babys grow and get eaten, how satisfying. Thanks for your comments Sara, Naomi and Danny. 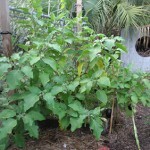 I had two tomato plants w/green fruit when I left town in Jan. for a funeral. A week later I came home to crispy dead plants, but the tomatoes still looked fine, though green. I fried them up and they tasted great anyway! Lettuce seeds that I had spilled by accident way back in Oct. sprouted in Jan. and grew wonderfully! It was a winter full of surprises. 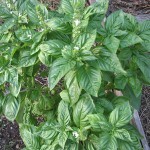 Thanks for your comment Debbie, I love how things turn out in your garden, and in your kitchen. Your garden today looks as though the cold winter never happened! I imagine that your property looked like an old house with ghostly sheets covering the furniture…that would’ve been fun to see! Nice post! Thanks for your comment Kimberly, The whole neighborhood was ghostly, and couple that with the biting cold, it really created an atmosphere.